Glass bird feeders, stained glass bird feeders, glass humming bird feeders to add whimsy and elegance to your garden and attract more wild birds. We review the best products and share tips with you. You want to introduce a bird feeder that is different from the standard platform feeder or tube bird feeder? Why not try a glass feeder? They are more elegant, more stylish and make a statement in your garden. And they seem to attract more humming birds than plastic feeders. Maybe it is because they are more transparent and shiny, or maybe it is because they are more colourful. Whatever the reason, both you and your wild birds will love having a gorgeous, shiny feeder in your backyard. Glass feeders need to be cleaned more often. So only fill with enough food to last a few days to avoid waste. These feeders can be easily cleaned with a few drops of strong bleach. But please be sure to rinse thoroughly! It makes sense to have 2 glass bird feeders so that you can rotate when cleaning. You do not need to use commercial hummingbird mix. I have used a 4 cups water to 1 cup sugar mixture for years and the birds love it! Check to see that the container is airtight and that the nectar doesn't drip from the feeding tube. I find that there is always some leakage. Look out for glass feeders made from recycled glass - helps the environment and that helps the wild birds. 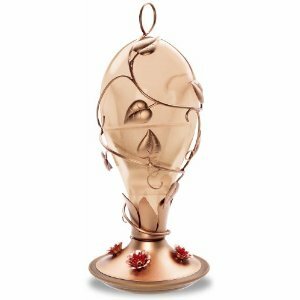 This beautifully designed hummingbird feeder will definitely add beauty and function to your garden. 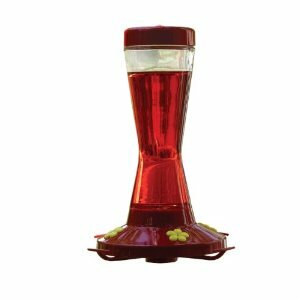 It is made of durable, tempered tinted glass, and it's 32 ounce capacity offers the hummingbirds a good feast. The integrated perch invites the hummingbirds to sit and dine in leisure - yours and theirs! I've been using the same one for 3 years now and it is still in perfect condition. The glass is much more sun-resistant than plastic or wood. The size is surprising - it was bigger than expected from the picture. You have to change and clean this glass humming bird feeder at least every 3 days so don't over-fill. You may need to adjust the wiring so that it hangs at the right level - do this to stop the nectar from dripping. Hang one of these in your backyard and get ready for the compliments! 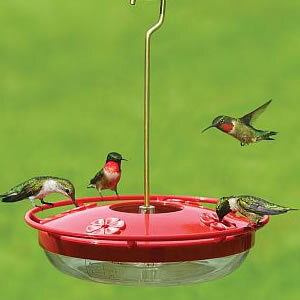 I love this attractive yet simple feeder with its 4 feeding ports, full-circle perch and holding 16 ounces of nectar. It unscrews easily from the feeder base for quick cleaning and filling. Included is a hanger to hang it from a branch or hook. The clear, shatter-proof glass reservoir makes it easy to see the nectar levels. This feeder is reasonably priced but well constructed and made from heavy solid glass. The yellow flowers pop out easily and can be replaced. Another great feature for these feeders is they don't leak nectar. They are heavy and stable, and even bigger visitors can enjoy the juice. They hold just the right amount of sugar water for 3 or 4 days (any longer and the nectar goes bad). Male: Head, throat and upperparts bright, deep cobalt blue. Breast chestnut. Blue on belly and undertail coverts. Varying amounts of chestnut on back. Eyes dark. Legs dark. Female: Uniform pale blue body. Slightly darker back with abdomen and undertail coverts grayish. Feeds on insects in summer, fruits and seeds in winter. Eats insects, seeds and nuts. Nest in cavities in trees and snags, or between bark and trunk. Nest woven of dry grasses, straw, conifer needles, fur, string, or cedar bark strips. Uses nest boxes. Common sight in parklands of the West. 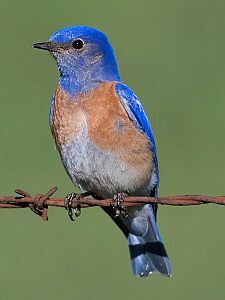 Unlike the other species of bluebirds, it does not like large meadows, preferring open forests instead. Call a soft "kew," often repeated several times. Also a chatter. Songs can be repeated calls. Conservation status is Least Concern but declining in California and Arizona, as well as in other parts of range.